"Sometimes I react to immediate visible reality and sometimes I am prompted by ideas, but at all times I have been moved, to paraphrase Seamus Heaney, by the music of the way things are...."
"One of those things I can't stand is that every time people talk about you they immediately want to put you in a box, influenced by so and so. But you don't derive directly from anyone." "I see myself as a well-working lens, a perceiver of something that exists independently of me: don't look at me, look what I've found." "I think human beings have a nostalgia for a relationship with a work of art. It's a mutuality. Beauty is not in the painting, and not in the eye of the beholder, but in between." On the famous "Irascibles" photograph: "I am known more for that darn photo than for eighty years of work. If I had an ego, it would bother me." "I don't expect too much from a show....The work of an artist gets its total meaning when he [draws] his last brushstroke." "With time I have learned to lose my identity while drawing and to act simply like a conduit, permitting visions that want to take shape to do so." "One can find secret significance at the depth of the ordinary. I believe that simplicity is an invention of man. Nature is never simple." 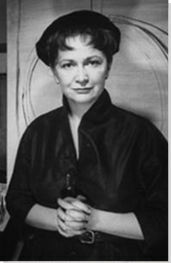 Hedda Sterne was born Hedwig Lindenberg on August 4, 1910, in Bucharest, Romania. Her father Simon taught languages and her mother Eugenie was a housewife. Money was tight, but Sterne was in love with reading and escaped into innumerable literary worlds. She read Dostoevsky by age eleven and stayed home for a month to read all of Proust. Though her family was Jewish, they were not religious. Her father was agnostic and her mother, in Sterne's words, "was totally uninterested and indifferent." Sterne's formative years came during World War I, when her father stepped up to care for his deceased brother's wife and her mother. The family moved into her uncle's spacious and elegant home, which, with its multiple paintings on the walls, was much more aesthetically pleasing to the young girl. Her aunt, a singer, played Schubert and Schumann; her brother studied the violin, and she began drawing, sculpting, and creating ceramic pieces. When she was seventeen, she went to London and saw a flower show at Chelsea, which was a discovery; Sterne recalled, "It was just unbelievable. I had such an epiphany. I was changed for life by that show. I went back and had the urge, finally, to paint." Sterne ached to get to Paris; she remembered thinking "Romania was like a colony of France. Everything that was worthwhile was happening in Paris, and if you weren't in Paris you were in exile." When she was eighteen and nineteen she began going for a few months at a time while studying philosophy and art history at the university in Bucharest. Her favorite thing to do was peruse the bookstores, marveling at the "French books" and at "Surrealist magazines", at "Cahiers d'art. All of that. Week after week I was there, looking, looking, looking." In 1930, Sterne finally moved to Paris full-time, studying at Fernand Leger's atelier. She never saw him until she moved to New York, interestingly enough, but valued the space to work. A Surrealist artist friend from Romania, Victor Brauner (it was one of his works that Sterne maintained was the first painting she ever saw, at the age of six), introduced her to people in his circles. In 1938, Surrealist Hans Arp saw her work, consisting mostly of Dadaist and Surrealist collages, featured in the Surindependents exhibition and, with the help of Brauner, arranged to have it sent to Peggy Guggenheim for exhibition in her London gallery. Sterne married Frederick Stern, a childhood friend from Bucharest and travelled back and forth between her hometown and Paris for a time. The marriage with Stern did not last, but the two remained good friends (after they separated she kept his last name but added an "e"). It was Stern who facilitated her escape from Europe during the early years of the Nazi persecution of the Jews. She admitted frankly that she barely escaped "unspeakable death" but did not expand upon it in interviews. Traveling through Portugal, where she had to wait because the ship to America she was supposed to take was sunk by submarines, she finally made it to New York City in October of 1941. There she quickly fell in with other expatriates and artists due to the "kind of solidarity" that led to "immediate friendships." Her notable friends included artists Marcel Duchamp, Willem and Elaine de Kooning, and Franz Kline, as well as art historian Meyer Schapiro and critic Harold Rosenberg among others. Her experience of New York was, as she put it, "more surrealist, more extraordinary, than anything imagined by the Surrealists." She and Saul Steinberg, her second husband whom she married in 1944, loved to go sightseeing every Sunday in the city. Bridges and highways fascinated her and found their way into her work; the busy highways also inspired her to start using spray paint, which, because of its tendency to blur, evoked movement. 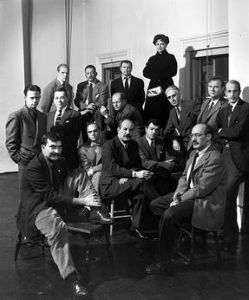 “The Irascibles,” photographed by Nina Leen and featured in the January 15, 1951, edition of Life magazine, shows Hedda Sterne standing above her male Abstract Expressionist colleagues. Though Sterne fell in with the Abstract Expressionists, frequently showing at the Betty Parsons Gallery and was named one of America's best artists under 36 by Life magazine, she never really felt part of the group and, in fact, resisted group affiliation throughout her career. Regardless, her inclusion in the now-famous photo known as "The Irascibles" meant that she was mostly known in the context of that postwar American movement. The photo, taken by Nina Leen in 1951, accompanied a protest letter signed by twenty-eight artists and directed to the Metropolitan Museum of Art, which was mounting a show on so-called "contemporary art" without actually showing any of the vanguard art of the day. Leen set up chairs that had the artists' names on them, but as there was no chair for Sterne, she simply stood behind the other artists - all men. Sterne maintained that "nobody's center, and everybody is important. Nobody is neglected." However, in 1981 she told an interviewer that the male artists "were all very furious that I was in it because they were all sufficiently macho to think that the presence of a woman took away from the seriousness of it all." Sterne and Steinberg separated in 1960, although they never officially divorced and remained friends. Sterne commented frankly that even though both were artists - Steinberg was an illustrator and cartoonist, most notably for The New Yorker - "there was never something of mine on the wall. And lots of people, our friends, didn't know I was Hedda Sterne." Ever experimental, Sterne painted abstract compositions, some inspired by machinery, portraits, and a series based on heads of lettuce. The abstract works of the 1960s, which she begun on a 1963 Fulbright Fellowship in Venice, in particular, are indebted to her embrace of meditation, which she told an interviewer she did every day. She did not have a guru but, as she explained, "I read all the books. I gradually worked out my own system... It has to do with cleaning the lenses, you know. Developing and taking care of your mind. A mind has to be both reflective and transparent." In the 1970s, after a decade of experimenting with everything from surrealistic machine-like contraptions, to ethereal abstract works with verticals and horizontals, and to organic formations modeled on lettuce, Sterne returned to painting portraits, having always felt that faces were interesting. She marveled that some people in the art world "were scandalized by my doing something like that, instead of 'speaking abstract.'" In the mid-1970s, she embarked on a monumental painting that consisted of thoughts and quotes from books that she read, a large-scale version of the diaristic practice that she and others had done for years but that took on new connotations in the midst of contemporary Conceptual Art practices. Reluctant to stay ensconced in one particular style for too long, beginning in the 1980s she worked in a language of geometric prisms and esoteric signs and symbols. Later in her life, Sterne had difficulty seeing color, and shifted to drawing during the 1990s. Of her later working days, mostly in Long Island, she enthused, "I got up in the morning impatient to work." Drawing was revitalizing for her, as she was constantly "in a state of euphoria and exhilaration." In 2004, she had a stroke, which, combined with the macular degeneration she already had, meant that her eyes were worse than ever. She largely stopped producing art and told an interviewer frankly, "Now that I am so old and incapacitated, I don't do anything with great enthusiasm. You know, thinking, dreaming, musing, become essential occupations. I am watching my life. As if I'm not quite in it, I watch it from the outside." In August 2011, Sterne celebrated her centenary with family and friends; she was the last living first-generation Abstract Expressionist painter. She died in her home of old age eight months later. Hedda Sterne lived to be one hundred years old, and within those years had a prolific and unceasingly experimental artistic career. She was an early Surrealist, her beguiling and disturbing collages reminiscent of Dora Maar, but she achieved most of her fame when she was grouped with the Abstract Expressionists in New York in the 1940s and 1950s. Always deeply original and reluctant to eschew all elements of representation, her work inspired other female artists in the movement such as Elaine de Kooning, Grace Hartigan, and Helen Frankenthaler. Her New York City series of the 1950s was notable for her pioneering use of spray enamel paint, inspiring future artists to go beyond the paintbrush and embrace mass-produced materials. The portraits of the 1960s and 1970s were criticized for the use of figuration in a time when Minimalism reigned supreme, but Sterne cared little; her iconoclasm inspired other artists to disdain dictates and strictures and create what they wanted. Artists like Susan Rothenberg, who, when told painting was dead, famously decided to devote herself to that very medium, or Philip Guston, a former Abstract Expressionist who also decided to embrace the figure, are indebted to Sterne. Sterne was first and foremost a Surrealist, and she experimented with collage, creating her own technique that she called papier déchiré et interpreter, loosely translated as paper torn and interpreted. The technique entailed ripping up paper and letting the scraps fall, forming uncanny images and associations in her mind that she then brought to life by gluing the pieces together and supplementing them with pencil. Untitled is similar to the work of fellow Surrealist Dora Maar in its elegant but unnerving juxtaposition of recognizable anthropomorphic elements and inscrutable shapes. In the center of a pale pink and white background a curious figure rests. It appears to be a woman's torso, with one languidly arching slim hand that, from the mid-forearm up, is swathed in gray fabric. That fabric seems to be part of a blouse or dress, but it never fully coalesces into such a garment; instead, it curves into the shape of a diminutive, birdlike head with one large human eye staring askance at the viewer. Out of the back of the "head" is a curved appendage, almost like the neck of a swan. Sterne creates a degree of unity and harmony in the work by picking up the thin but dense lines of the creature's garment/head/neck and extending them out around it in diaphanous veils. Sterne believed that "art is essentially an act of freedom," a sentiment that is embodied in her Surrealist works. Surrealists sought to liberate themselves from the strictures society placed on the conscious mind, letting free association, chance, and dreams play central roles in artmaking. With that came a blurring of the real and the surreal, the individual and the universal, fact and mystery. Sterne's collage takes familiar elements - the woman's hand, an eye, a garment - and combines them to elide any possibility of a metanarrative or truth. The image is unsettling, evocative of Freud's concept of the uncanny, which he deemed "that class of the frightening which leads back to what is known of old and long familiar."